Discussion in 'Troubleshooting Help' started by OzJustin, Feb 7, 2019. Seeking some advice. PC specs are per my sig. PC has been running fine then came back to my PC yesterday and screen was black as if no signal and non-responsive but PC still running. I rebooted several times but the PC failed to POST. Initially I had thought it was my graphics card as both fans were not running but would perform a small ‘twitch’ every 4 seconds or so and then stop. I swapped this card with an old one and was able to boot into Windows again fine. I have since reinstalled my current graphics card and installed the latest nvidia drivers and PC seemed fine for an hour. I came back just now and the screen is black again and the card fans are ‘twitching’ on and off again. Edit: I just read some EVGA forums and apparently the idle fan 'twitch' is normal for the card. 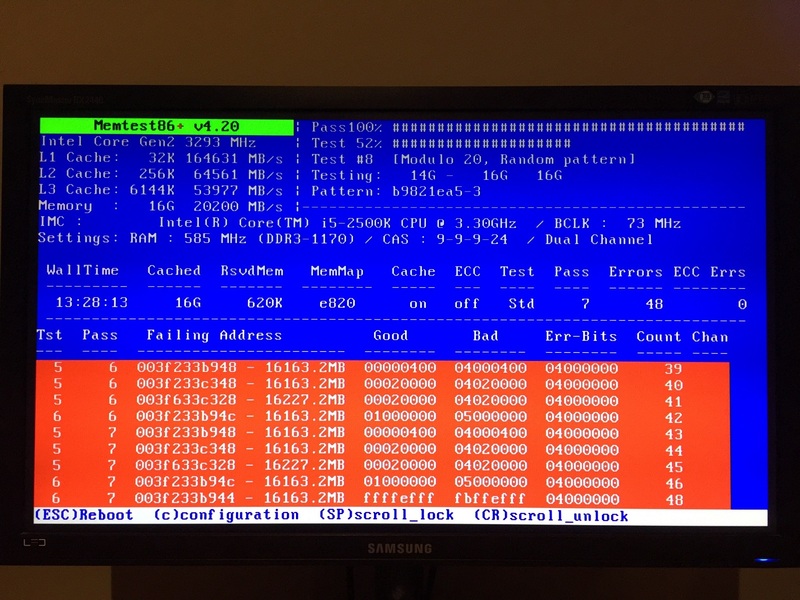 Are you thinking RAM is causing this locking up or some other additional issue? Further diagnosis undertaken. I have been testing each stick of RAM for several MemTest passes over the last few days. I’ve run stick 1 in slot 1 and no errors; stick 2 in slot 2 and no errors, stick 4 in slot 4 and no errors. 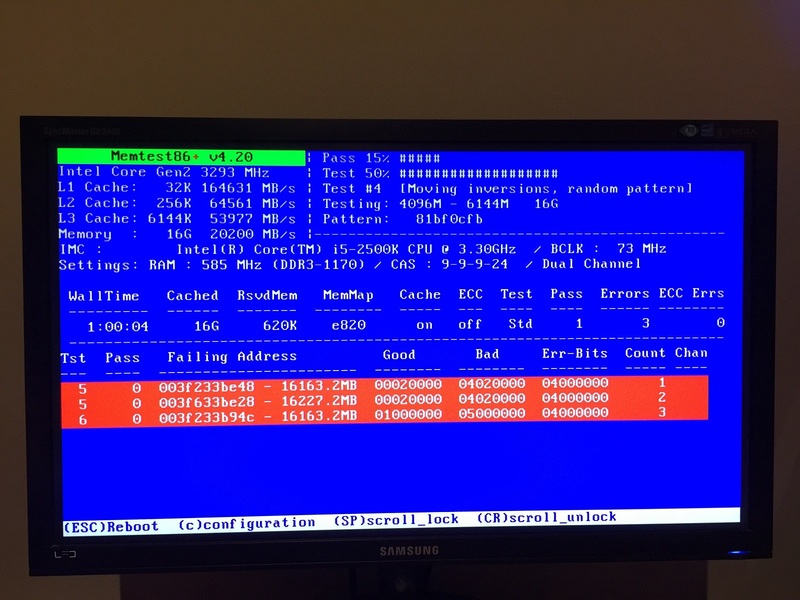 When I got to stick 3 in slot 3 my PC would not run and boot into MemTest. I moved stick 3 to slot 1 and again it wouldn’t run. Thinking stick 3 was the problem I then reinserted previously working stick 1 into slot 1 but now the PC wouldn’t POST with it. Normally my error LED panel on my motherboard lights up when I start my PC but I was getting no power from the motherboard. My hard drives and fans were working fine though so I don’t think my PSU is the problem. I can test with my PSU tester later if needed. Given the now lack of response from my motherboard I wondered whether my CMOS battery could be dying. I pulled it out and tested on a multimeter and seemed to be showing well less than 3v. Installed a new battery and the PC booted and asked me to set my BIOS clock etc, however, I couldn’t as my USB keyboard wasn’t being recognised. I plugged in an old legacy keyboard to get around this but now my PC refuses to POST again and I’m getting no LEDs on my motherboard again. Does this suggest there is a fault with my motherboard rather than my RAM, graphics card etc? How would you recommend I diagnose further? Just closing out this thread. It ended up being faulty RAM which is in the process of being replaced under warranty.